To verify an election setup is ready to go, start by clicking Elections, and find the election you want to verify. 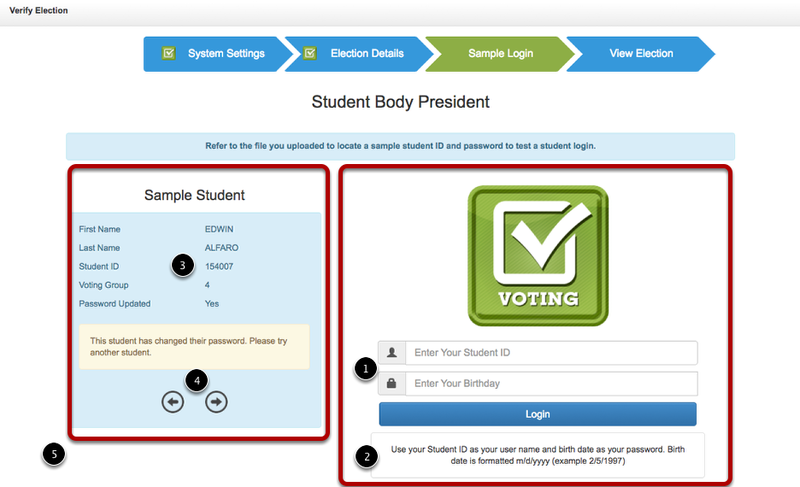 Note: You do not have to verify an election for students to be able to vote. This is just an optional step to make sure all your settings are correct and your students can login. There are 4 steps to complete your election setup. First you will verify your System Settings. The 4 System Settings to verify is that your time zone is setup correctly, the label for your user name and password are clear and descriptive for your students and the login notes are also clear and descriptive to help students login. For example if you are using student birthdays as their passwords, we always recommend that when you upload your file you check the option passwords are dates so we can format them all the same and provide your students a clear description for their passwords. You can change any of these settings by clicking on the blue text link. If all the settings are correct, check the box at the bottom "The above settings all look good" and click submit. As you verify each of the 4 stages you will receive a green check to the left of the title to let you know that stage has been completed. Clicking on the blue text will display a pop-up with the the current text which you can modify on the spot. If you are using birthdays as passwords, clicking the "Use default date password text" button will add the suggested description as your login notes. This next section will verify that you have your election setup correctly. Just like the last step you can click on any of the blue text to make changes to that sections. 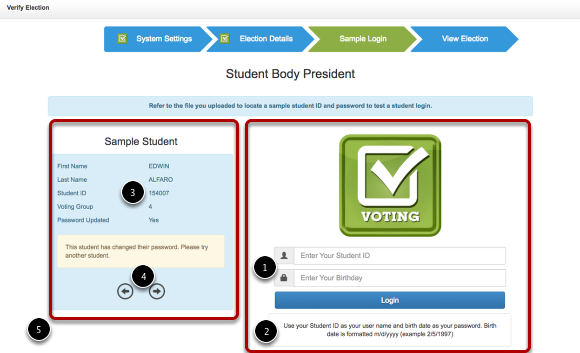 Who can vote will display the students that are eligible to vote in this election. If you have do not have students eligible to vote, you will receive a red X. To fix the issue, click the blue text below the title and add your voting groups or select everyone. If you have not yet uploaded students, you will need to complete that step before this option will be marked with a green check. When can they vote will display the start and end date and time. As long as your election end date is in the future this will have a green check. Do you have Candidates in this example has a red X because we have not yet added candidates. Clicking the No Candidate text will take you to the add candidates page where you can add candidates to your election. Once candidates are added we will display the number of candidates you have per position. Have students already voted will let you know if you have any students that have already voted in this election. This is to confirm you are not reusing an old election that students have already voted in. There are 3 options that can be displayed here. (a) Green Check - No students have voted. (b) Red Exclamation Mark - Students have voted between the start and end date of your election. You will get this exclamation mark if you are running the preflight check after students have voted. (c) Red X - Students have voted before the start date of your election. This typically means you are trying to reuse an old election. We recommend you duplicate the election if you need to reuse it. This is one of the most important steps and where we find the most errors when customers are getting started with our software. On the right side you will see a sample student login. This is an opportunity for you to test a student login and see view the login screen. On the left side are sample students that you can use to try and login. We are not able to display the student password because it is encrypted on our server so you will have to find a sample password from the file you uploaded or ask a student to try and login on this screen. Verify the descriptions for Student ID and Password are correct. This was setup on the System Settings. You can always click on the System Settings blue chevron to go back and make changes. Verify that the notes are correct and have a good description for students. Again this can be modified on the System Settings. Verify that the student information was uploaded correctly. Student first name, last name, ID and voting groups all look correct. You can use the left and right arrows to view at other students. The next step in this process is to login with a student. You can use the student ID from the left side and locate the password for that student and attempt to login. If you allow students to change their passwords, you will see a message if that student has already changed their password. Once you have successfully logged in, it will take you the last step which is View Election. This is an opportunity for you to see what the students see when they vote. You do not have to go through all the steps to view the election. If you just want to preview the election you can click on the View Election chevron link to go directly to this page. Once your election has been verified you will get a green check under the preflight column. If you are going through this preflight option after students have voted it is not possible to get a green check. That is ok and your election will still be valid as long as the rest of your settings have been verified.